As you may have seen from Alexandre's post below, the new 8070 Supercar, hit the shelves in UK. I got the news this morning by mail from Huw (who runs the indispensable Brickset.com). The new car is an exclusive from Argos in UK, where immediately he also went to buy one exemplar from the local branch. From all the reactions we can find online, the mails and Gtalks I got today, it seems everybody is running into a kind of hysteria about this long waited model, and its little new part. Below some better quality scans from the partslist, in the model's building instructions (got via Ryan). 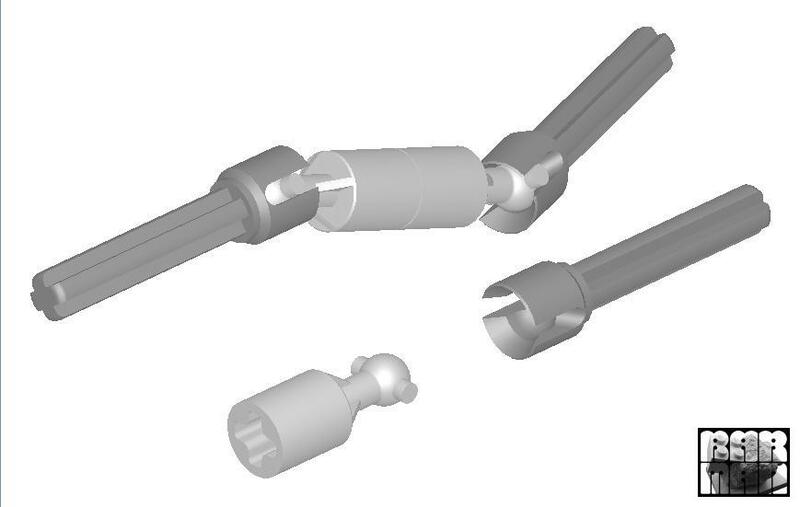 There we can see listed the new 'CV Joint Axle' below, which together with other already existing parts [1, 2], offers new and more compact ways to build suspensions or even a new possibility to build U-Joints. Namely this brings realism and the possibility to design realistic suspension arms on smaller scale vehicles, by recessing the pivot point by 1L, when compared to the traditional 3L U-Joint. This is exactly how the new part is used at 8070's rear axle, next to the differential on each wheel side. See it in detail from the pictures below, kindly provided by Huw. Coincidence or not, this new part looks exactly like the one designed and proposed by Barman, already in 2009. Meanwhile junglistjoey has published online, some photos and one still unedited video from his new 8070. Guess there isn't much more secrets to reveal about this set. Hmmm I wonder why they started using black 20t gears again in stead of tan... Is it because a black one is also uses for HoG steering from the roof and they didn't want to include two colors? Or a change in the color code (again)? I must say I am a bit fed up with the fact 8258, 8265 and 8070 all use the same construction of the frame with the differential and the 3L perpendicular connectors. A bit more variation please. underwhelming...I hope transformers has something better to offer this summer!! I think one of the main reasons behind the developement of the perpendicular connectors is what you are seeing here. I think this model is pretty great except for the tiny seats and ugly rear end. Back in 2005, at Legoworld Zwolle, an older TLC-man promised they would make a stronger alternative for their universal-joints. He was talking about a cv-joint based one. When the 3L U-joint came out I thought it would never happen to get stronger designs. Nothing that it is mandatory to have, but I hope they once produce an axlehole variant from the new part, like its counterpart. It would be more effective for other transmission designs. However I recognize the axle verison is the one offering the most compact design solution, for the 8070 specific needs. Can you use this part in combination with all the other ball-joints? Got to say, I'm somewhat tempted by this... I wasn't really too bothered before as cars don't hold much interest for me, and I think the functionality could be done without the motor, but having seen the parts (I have almost no suspension parts beyond the springs) I may have to get one. Though I might wait for a sale first. Also, I am thinking now that the Unimog will also have suspension. This new part would suggest as much, especially given that it is a licenced set which should be as accurate as can be achieved in a Technic set. The first thing I will do when I get this set is eliminate the motor and battery and build a hidden turning function like the car on crowkiller's website. This way I can rebuild the tail end of the car so it doesn't look so bad. Because it does not look pretty especially when compared to the rest of the car. And wile the retracting spoiler is interesting, it doesn't look very realistic to anything that I have ever seen on a car. In fact when it is extended, it looks king of stupid. I think the spoiler mechanism is the best part of this car. It is wierd how the engine hood opens the wrong way -crowkiller's car is more reaistic in this respect, But 8070 has a much more elegant light chassis (crowkiller's chassis uses way too many big beams). I really like this new car model. It does have a few flaws. I also love crowkillers model. I think he do a very good job with it. His model has things that Lego does not and Lego has things that his does not. Like the butterfly doors and motor functions. Many high Performance cars have a hood that opens this way. Like the Chevrolet Corvette and some BMWs. The CV joint will certainly bring features to my Supercars that I previously have not be able to add due to width issues. Great part, cannot wait to get the part. I guess we should keep encouraging Barman to develop new part ideas. This car reminds me of Mike's New Car from Monster's inc with all the useless motorized functions :P.
Except that car was ORANGE, and had 6-wheel-drive! That would be 12 CV joints and 6 of the new piece. I think I'll wait until 8070 is released in Monstropolis. Lets pray for the Unimog, to bring at least 4 of them. model is very good and it has to have a light frame to hold the weight of the battery box and motor. I like crowkiller model much more for overall appearance and functions. it have many more pieces, but beautiful overall. People really need to stop comparing the 8070 to Crowkillers' model as there is NO comparison. The 8070 is just all around better. Any model released from Lego that is designed by their Master designers will always be better than anything that a typical AFOL can build. If you need proof, Just look at the construction between the 2 models. The Lego 8070 is just built better and with minimal parts. And the reason why the interior looks smaller is because of the great mechanisms that work the doors. And so the steering wheel doesn't steer the car, it's not a big deal in my opinion. The rear spoiler on the 8070 is just flat out amazing, Crowkillers' just goes up and down, so people really need to stop nitpicking at something that they could never dream of building on their own without an instruction manual. For as much as Paul or Crowkillers wants to believe that his models are on par with official Lego ones, I am sorry to say that sadly he probably won't be getting any calls from them in the near future for a job because his level is not the same as the great design team that Lego currently has. Sorry to sound harsh, but some of you guys really need to get a clue when it comes down to the time and effort that goes into designing an official Lego Model. I've mixed feelings about your opinions. While you're right at some aspects like the effort spent to design an official model, I disagree with your POV in many others. First I won't consider Paul as typical builder/AFOL. He's well above the average. Also the 8070 spoiler design is accessible to several of the best Technic builders out there. Probably you're right saying that 8070 chassis is optimized in terms of the amount of parts used. It however doesn't make the Crowkillers version inferior in the way you are suggesting. I've always liked Paul's cars, but I'm also the first to say, that most of the models prior to Gallardo have used simply too much parts to be comparable with official models in any way. However Paul's designs have progressed immensely since then. But that's natural I'd say. The very good Technic designers that TLG has today, also didn't come overnight. It requires years of training and experience. I've never heard about Paul willing to have a position as a Technic Designer at TLG!? In my perspective both models have ups and downs, being the 8070 one official LEGO model, and Paul's design one model strongly inspired on the official model photos, but still designed by one respectable fan within his limited efforts and resources. Sorry, but I feel the need to express my thoughts on this matter. I am not sure if one of your family members is a designer for TLC or what, but your comments are flat out silly. Paul Barotko is easily one of the most influential pure Technic designers in the world. Yes, I called him a designer, because that is what he is. I have built the Gallardo model that he designed, and from a semi skilled builder's point of view, it is right on par with any set that an official "Master" designer from Lego could do, in fact if this were a set released from Lego, you would never know that it was designed from outside of their company. And I also think that the car that he built that was inspired from the few pictures that were available of Lego's new 8070 is very amazing in it's own right. I would also go out on a limb and say that he is probably one of the most copied Technic builders out there. In fact when you look at the 8070 and look at his Brickshelf folder at some of his past cars, you can actually see similarities of building that he has used in the past, so perhaps he not knowingly pushed the envelope to make the 8070 set as good as it actually turned out to be. I didn't do the exact math, but it appears to me that his brickshelf folders have close to a million hits and with as popular as his designs are, I find it very hard to believe that no one on Lego's design team has ever been one of those viewers and perhaps got inspired themselves. Just from looking at the comments section on Paul Barotko's website, I would say that more then just a few people have been turned on to start building with Lego purely based off of his work. It is the exremely talented builders like this that are keeping the Lego world going by showing what else is out there and can be done with lego. I do not know you or who you are, but your comments sound more like jelousey to me more than anything. Or maybe I am biased because I am not only a huge fan of his fantastic work, but also became good friends with over the past 3 or so years. I don't see any of the mLA's listed in the parts lists. This makes me think that the parts list is three pages long! No mLA's are used in this model, everything is done by the "old" methods! Ok, I've hosted also the photobucket images at TBs, to overcome the photobucket traffic limitations. "...in fact if this were a set released from Lego, you would never know that it was designed from outside of their company." Absolutely NOT true. The building style is nothing like that of an official Technic set. Crowkillers' chassis is made from lots and lots beams. It is actually more comparable to system building. One beam (+pins) is added after another in a simple, easy, logical manner. The result is strong, but inefficient. The first building steps for 8070, on the other hand, was probably to make a few flimsy sketches (with functions), improve one until all the functions work properly and THEN strengthen it using minimal parts. Crowkillers' car is not bad, but an official set actually takes a lot more time and effort to build. Crowkillers probably has the ability to build like a real Technic designer, but it would be a waste of time. Erik was obviously talking about Paul's Gallardo model being close to that of an official designed set, not this last model that he built. And from looking at the instructions for it, I can definitely agree. There is much thought and skill put into that Gallardo model. No doubts about that. I also don't think that the chassis in his new car is simple as you put it. After studying the chassis pictures that he has posted on brickshelf, there do not appear to be extra beams as you put it, what you say are stacked actually look like L shaped beams which in turn probably serve a point in the construction. I think that he possibly build the car this way to not lose space on the inside area where the seats and transmission box go. if you look at side views of his car, everything looks like it goes where it would in a real car without losing the normal space and also look symmetrical. Also, what you mean by waste of time? There are actually many similar things with this car and the 599 GTB. And to anonymous, after we finally get to see how the chassis is set up on the official car, I agree that it is probably a better build than what crowkillers' accomplished, but to say that his build is "simple" and "not bad" is just comical. To me is does not look like someone just stacked a bunch of large liftarms and pinned them together. After all he did build it without having a clue as to how anything worked or was setup and I highly doubt that he built it overnight. silly question. why would they not have it perfectly in the middle? "Clam shell" hoods and trunks are not normal but there are cars that do this most are Hp cars. Even my car has this and its rather cool. Pluss you never have to worry about the hood come off at speed since the hood open from the rear. Now my trunk on the other hand is a worry if that thing ever poped open at speed it would take flight. I have lost front hoods before at high speeds and they turn into UFO's. Building with minimal parts etc takes longer than building with lots of beams, so it is a waste of time unless it is used for some good reason (e.g to reduce weight). The Lego model was obviously forced to use minimal parts to accomodate the weight of the battery box and motor on the suspension and uses a completly different design for the functions. But this also sacrificed in other ares of the model. I think you are correct. it does look like the controls are favoring one side by a stud length. This would make sense and make it much easier to line up all of the gears and clutch gears and perhaps this left room on the other side for the drive axle to pass through so as to not interfere with the functions? If this is the case, this would be another one of the sacrifices that I spoke of above. Hello all. I just completed the new 8070 set and overall it is very good. The functions work very smoothly and it has a really nice look to it but also a few disappointments as well. As for some of the comments here, I would like to add my own. First off you cannot compare an AFOL's model with a Official one, that is true, however, I would really like to congratulate the guy for the job he did with his own version because after completing TLC 8070 and looking at the pictures and watching his video, he did an absolute stand out job with the way he incorporated the routing work with his functions and kept everything in a nice compact area, along with keeping the cockpit area intact and even. I had seen pictures of his car before I purchased the new set and had just assumed that he probably copied the inner workings from the Official set and much to my surprise, I was completely wrong. This fan made car is an excellent build and very intricate. Saying that it was a simple build is ludicrous and completely untrue. There are many building techniques that I see from just pictures that I have never seen before. I am very surprised how TLC went about it though. As someone had asked a few posts up about the function/control box being in the center, the answer is NO, it is actually closer to the passenger seat. This to me seemed like an unnecessary shortcut and really takes away from the overall build experience. Also to the above poster talking about stacking beams, from what I can see and what I have built, there are no more beams stacked in the fan made car than there are in the 8070 set. The 8070 does use less of them, but they were able to do so as a compromise for what was left out and what could have been. Of course these are my own thoughts and everyone is entitled to their own opinion. I said the building style Crowkillers used was simpler than that used in the real 8070, not that his car was 'simple'. Building style does not matter much, but when comparing Crowkillers' car to 8070, the building style is the most significant difference. 8070 wins, but it probably took longer to build. One thing that I have noticed is that the fan made car has things that the official doesn't, which I am disappointed with, but also understand. It is a real bummer to learn that the steering wheel is fake and the function box is offset to one side and the interior seats are so tiny to accommodate everything else. Lego is a business and their job is to design a "great" set for as cheap as possible, which means minimal parts and just enough features to satisfy children, because after all, that is who they design the sets for. hi there, that is a grate lego car. I like it. You can't say that building that car it's waste of time, indeed takes a lot of time and patience, but if you like doing that, there is no wasted time.